We’re in for a big year with meteor showers. So when and where should you look to have the best chance of seeing nature’s fireworks? Here we present the likely meteoric highlights of 2018. These are the meteor showers most likely to put on a good show this year. Showers that can only be seen from one hemisphere are denoted by either [N] or [S], with those that can be seen globally marked as [N/S]. The Lyrids hold the record for the shower with the longest recorded history, having been observed since at least 687 BCE. That longevity is linked to the orbit of the Lyrid’s parent comet, discovered in 1861 by A. E. Thatcher. Comet Thatcher moves on a highly inclined, eccentric orbit, swinging through the inner Solar System every 415 years or so. Its most recent approach to Earth was in 1861. Over the millennia, that shed debris has spread all around the comet’s vast orbit, meaning that for thousands of years, every time Earth intersects Comet Thatcher’s orbit, the Lyrids have been seen, as regular as clockwork. One study of the orbits of Lyrid meteors even suggests the shower may have been active for at least a million years. For observers in the northern hemisphere, the Perseids are a spectacular summer highlight. At their peak, rates often reach or exceed 100 meteors per hour, and they are famed for their frequent spectacular fireballs. The Perseids are probably the best known and most widely observed of all modern meteor showers. Like the Lyrids, the Perseids have a long and storied history, having been observed for at least 2,000 years. Their parent comet, 109P/Swift-Tuttle, is a behemoth, with the largest nucleus of the known periodic comets – some 26km in diameter. It has likely moved on its current orbit for tens of thousands of years, all the time laying down the debris that gives us our annual Perseid extravaganza. It will next swing past Earth in 2126 when it will be a spectacular naked eye object. In 2018, the peak of the Perseid shower coincides with the New Moon, and so is totally unaffected by moonlight, which makes this an ideal year to observe the shower. 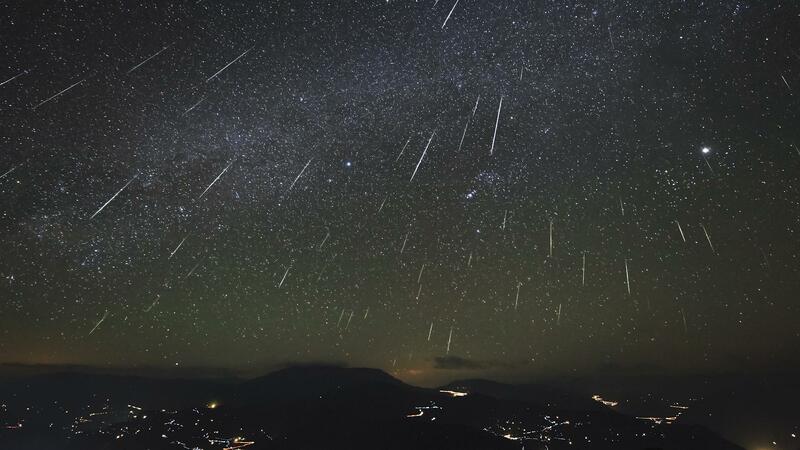 The Draconids are a fascinating meteor shower, although in most years, somewhat underwhelming. 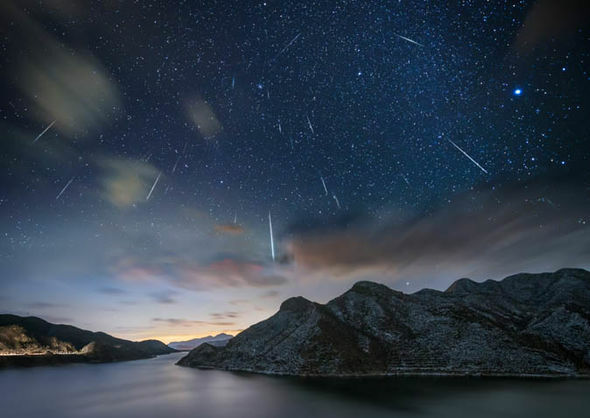 Unlike the previous showers, the Draconids are a relatively young meteor shower that can vary dramatically from one year to the next. First observed less than a century ago, the Draconids (also known as the Giaocobinids) are tied to a Jupiter-family comet called 21P/Giacobini-Zinner. In 1933 and 1946, the Draconids produced two of the greatest meteor displays of the 20th century – great storms, with peak rates of several thousand meteors per hour. In those years, Earth crossed the comet’s orbit just a month or two after the comet passed through perihelion (closest approach to the Sun), and Earth ploughed through dense material in the comet’s wake. After 1946, the Draconids went quiet, all but vanishing from our skies. Jupiter had swung the comet onto a less favourable orbit. Only a few Draconids were seen in 1972, then again in 1985 and 1998. This year comet Giacobini-Zinner once again passes through perihelion and swings close to Earth’s orbit. The chances are good that the shower will be active – albeit unlikely to produce a spectacular storm. Of all the year’s meteor showers, the one that dumps the greatest amount of dust into Earth’s atmosphere are the Taurids. The inner Solar System contains a vast swathe of debris known as the Taurid stream. It is so spread out that Earth spends a quarter of the year passing through it. The Taurid stream is complex – with at least two main components, known as the northern and southern branches. Typically, the Southern Taurids are active a little earlier in the year and reach their peak about a month before the northern branch. The Taurids are slow meteors and feature plenty of bright fireballs. So even though their rates are low, they are well worth looking out for, particularly when other showers are also active, such as the Draconids, the Orionids and the Leonids. Twice a year, Earth runs through the stream of debris littered around the orbit of Comet 1P/Halley. Throughout the month of October this gives rise to the Orionid meteor shower. The Orionids are a fairly reliable meteor shower with a long, broad maximum. Typically, peak rates can last for almost a week, centred on the nominal maximum date. Orionid meteors are fast – much faster than the Taurids that are active at the same of year. Like the Taurids, they are often bright, the result of the high speed at which the meteoroids hit Earth’s atmosphere. This works well this year, as the Moon will be in its waxing gibbous phase, setting some time after midnight and leaving the sky dark, allowing us to watch for pieces of the most famous comet of them all. As the year comes to a close, we reach the most reliable and spectacular of the annual meteor showers – the Geminids. Unlike the Perseids and the Lyrids, which have graced our skies for thousands of years, the Geminids are a relatively new phenomenon. They were first observed just 150 years ago, and through the first part of the 20th century were a relatively minor shower. But since then rates have improved decade-on-decade, to the point where they are now the best of the annual showers, bar none. The reason for their rapid evolution is that their orbit (and that of their parent body, the asteroid Phaethon) is shifting rapidly over time, precessing around the Sun (wobbling like a slow spinning top). As it does so, the centre of Phaethon’s orbit, and the centre of the Geminid stream, are moving ever closer to Earth. Although the time of maximum this year seems to favour observers in the Americas and Australia, peak rates from the Geminids usually last around 24 hours, and so good rates should be visible around the globe. This year the maximum falls a day before the Moon reaches first quarter so the best rates are visible (after midnight, local time) when the Moon will have set and moonlight will not interfere. Jonti Horner, Vice Chancellor’s Senior Research Fellow, University of Southern Queensland and Tanya Hill, Honorary Fellow of the University of Melbourne and Senior Curator (Astronomy), Museums Victoria.